The Cornish village of Tregony is characteristically friendly. Known as the Gateway to the Roseland it is used to holiday makers but there are many residents as well. Consequently the pub (two minutes up the road) is lively, the post office and shop busy and the school thriving. Buses carry on into the Roseland diverting as they go to the many little villages along the coast before arriving at the end of the peninsula and St. Mawes from where a ferry could take you over the water to Falmouth. There are regular bus services from Tregony to Truro and St Austell where the main line railway stops. The nearest beach is a spectacular sandy one that stretches between Nare and Pendower and is 15 minutes drive away. A car is desirable if you are holidaying in this area, for no other reason than the hills – of which there are many. Basically Cornwall is beautiful. Rugged, wild, windswept one minute, sunny idyllic and peaceful the next. There is something for everyone, wonderful walks, sandy beaches, little, narrow, winding roads leading to ancient coves, friendly pubs, isolated forgotten ruins. You will have a lovely holiday, bring wellingtons and sun tan lotion – you will doubtless need both! 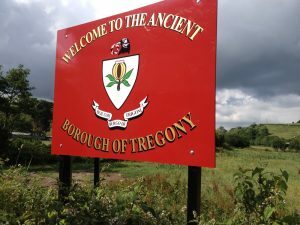 Tregony’s history dates back to pre Norman times. Once upon a time when the river Fal was tidal and navigable, it was a very important and strategic inland port. It is thought that Phoenician and Roman traders sailed in the valley below Frogmore Corner and went further up river in search of tin. The port at the foot of the hill would have been an embarkation point for travellers to Brittany and possible pilgrims to Santiago di Compostela in Northern Spain. But by the 16th century The River Fal, which had been Tregony’s lifeblood was silting up. Tin streamers and the natural shifting of the river made the port too shallow for ships to enter. Once the port became unusable, industry suffered and the area declined and never really recovered, although a cloth making industry did continue for many years and the Markets were a centre of trade for the Roseland area. Another casualty of the river was the Church of St James xxxx, which because of flooding and lack of repair was abandoned by 1549. The Church of St Cuby (Tregony’s parish church) then became the mother church of the combined Parishes. The Almshouses, known as ‘The Gallery’, that you see on the other side of the road were built in 1696 by Hugh Boscawen. They were originally given to Tregony as a ‘hospital for decayed housekeepers’! By the end of the 19th century only the walls and two end chimneys were standing and in 1897 it was extensively rebuilt when the wooden balcony was added. In 1631 there were 36 alehouses in Tregony ! 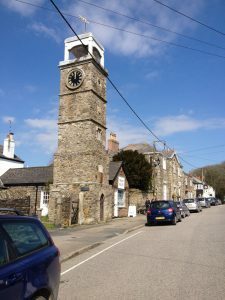 Another building of note in the village is the Clock Tower which was built of Pentewan stone in 1833. Locals tell of how the village council once sold the clock to a visiting Australian who wanted to take it back to his country. The villagers were outraged, dismantled the clock overnight, and hid it in a local field for twenty years until they were sure it was safe.